“Time is precious. Victorian Londoners treasured Memento Mori - keepsakes to remind them to rejoice in living each day well because who knows when one's time might run out. Designed as a team experience, Memento Mori is a Victorian murder mystery set in modern times. During 90 mins, players can expect intrigue and deceit alongside mysterious and colourful characters that would appear to come straight out of a Dickens’ novel. In other words, this is an event not to be missed. The Camden Watch Company’s very first immersive event will run on afternoons and evenings across Friday 31st August, Saturday 1st and Sunday 2nd September in, of course, Camden Town. AND YOU CAN WIN TWO TICKETS, COURTESY OF THE CAMDEN CARD! FIND OUT MORE BELOW! If you are already a Camden Card holder... persuade a friend/coworker/family member to sign up for the Camden Card, making sure that they mention your name in the "How did you hear about the Camden Card?" section! Here's the link to get them going. If you aren't already a Camden Card holder... what are you waiting for!? Sign up to the Camden Card now, making sure to quote the competition in the "How did you hear about the Camden Card?" section! Sign up here! -Tickets must be collected from the Camden Watch Company shop at Camden Market, quoting the competition. -Dates run from Friday 31.08-Sunday 02.09 and are subject to availability. 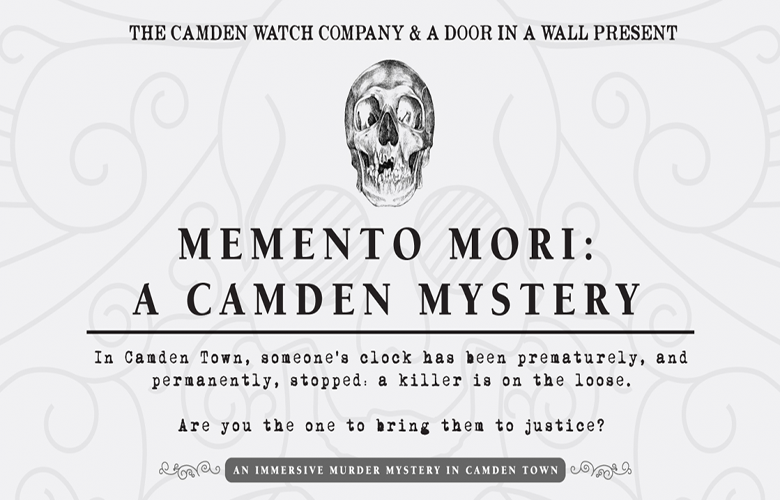 -Memento Mori: A Camden Mystery is +18s only, and my be subject to ID checks.